In these blogs, I’m going to slowly reveal the fundraiser’s secrets to success. I hope that doing this will help demystify the fundraising process and even help you become successful on your way to making something happen that will change this world for the better. Only some driving passion to do so would ever get anyone to become deeply interested in this topic. I’ll share as many of my fundraising secrets as possible, but only one step at a time. However, you may be engaged with a project of your own RIGHT NOW and may desperately need help, unable to wait for me to spell out those secrets over the weeks and months ahead. Drop me an email. Tell me all about your project and spell out the best way to contact you. Perhaps just a little email guidance is all you need to get on track to success. If need be, we’ll get on the telephone and talk and explore options and solutions. The important thing is never, ever to give up if you have a powerful case for doing something that will solve a real problem. If you think having me visit your organization would be an inspiration, I’m happy to do that. When I travel to consult on fundraising, I do charge a fee. On occasion, I provide on-site consulting for an entire day and conduct a workshop on How To Raise Millions. In those cases, there is a very intense process of screening to make sure that the cause and its leadership are both 100-percent ready to receive professional guidance. The final decision to help is always mine. Only start down this road if you are prepared to make your case for face-to-face guidance on my terms. Now, let’s get on to the nitty-gritty. Fundraising is always about money! It’s about budgeting, setting fundraising goals, planning campaigns, identifying donor prospects, planning how to get your message out to those prospects, and getting them involved in your project. It’s about soliciting money from individuals, corporations, and foundations. It’s about thanking people for their support and making them feel really good about supporting your work. And, it’s about doing it all over again next year. Most people hate this work. But a few, like me, are crazy in love with it. You may be attracted to the idea of having money to support your charitable endeavors but find the whole process of developing a donor base for that support to be mysterious, and maybe even unattractive. Still, you know that someone has to do it, or at least that it has to get done somehow. When I was a child, I was deeply moved by the parable of the good Samaritan. It just made sense to me that we were all in this world to help relieve the suffering of our neighbors, and as a child, I saw everyone as my neighbor. Of course, now I know the world is a bit more complicated than the way I saw it as a child. Still, nothing thrills me like programs and projects that are devoted to making this world a better place. And even if you have read only this far, I’m certain that some such project has you totally captivated and you need money to support that project. More likely than not, you’ll need to get a lot (or most) of that money from other people. That’s why I’m writing these blogs. I’m going to help you learn how to do that. But if you think this will be a quick, slam-dunk, learning process then you will be sadly disappointed. It has taken me a lifetime to learn these lessons. And it has required practice, patience, and determination to develop my artfulness in the employment of them. However, if you are truly passionate to learn them, I’ll do my best to teach you what I know. You get money from people who have money. I knew from the time I was very young that I wanted to be a social worker. After college, I even went to social work graduate school. I dropped out of that graduate program after one year, however, because I could not get on the community organization track that drew me to the field of social work. Instead, my school was determined to turn me into a caseworker or a group therapist. During my first weeks in graduate school, I was assigned to an internship. In my case, I worked twenty hours each week at the juvenile court located in the heart of St. Louis, Missouri. My professors were teaching me Freudian-based counseling, and my clients (all juveniles) were struggling simply to survive on the streets. The disconnect was obvious to me, but my professors didn’t get it. Everyone I worked with was ignorant about money, especially the “how tos” of getting money to flow from one person’s pocket to another’s. My “clients” were poor. Yet they had to eat and clothe themselves and find shelter, just like everyone else. So most of them turned to gangs that had illegal enterprises of all kinds that allowed them to provide for their basic needs. I was determined to discover everything I could about money, how to get it legally, how to hold on to it, make it grow, and even give it away intelligently. When I learned all of this, I wanted to share that knowledge with others so they could become self-sufficient and live within society as heroes, not villains. My odyssey to master the knowledge I sought was certainly a winding road. My first fundraising job was as PR director with United Way in South Bend, Indiana, at the age of 24. But with just one year on the job, I was certain this was where I would learn much of what I so desperately wanted to know—from the field of professional fundraising. Over the next 33 years, I became the master of my little universe, using what I learned for the benefit of charities of all types. Eventually, I became a philanthropist and began teaching my fundraising secrets to charities my wife and I loved. The story I tell in Turn Right at the Dancing Cow is just one chapter about where my journey has taken me, but it is the chapter that has moved me most. You will know why only after reading the book. 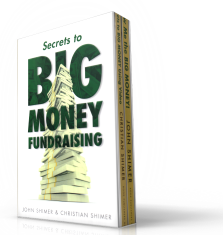 You may even learn a few of my fundraising secrets from that book, as I’ve salted it with several (especially in the last section of the book). In the next blog, “Why Fundraising Is Never Just about the Money,” you’ll see how these two seemingly contradictory ideas connect. In fact, if you set out to obtain money without knowing what I teach next, you won’t ever have any success in fundraising.